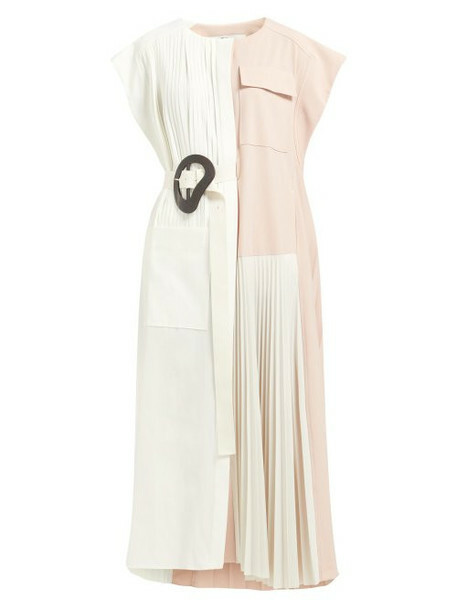 Tibi - Seen on the SS19 runway, Tibi's white and pastel-pink Edith dress captures the label's pared-back approach to femininity with a sweeping midi length and pleated panels across the bodice and hemline. The relaxed silhouette is segmented into blush-hued panels with clean, oversized flap pockets and the waist is semi-defined by a statement-buckle belt that wraps around half the garment. Wear it with white accessories for an effortless, minimal presentation.